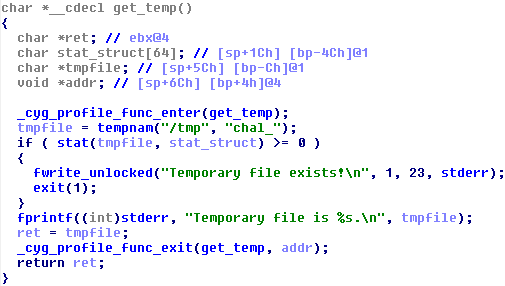 Challenge #18 "A small bug" was a common TOCCTOU bug very interesting to exploit reliably. @hellman already did a write-up on this challenge. His exploit reads the file name on stderr and hopes to win the race on symlink creation. But actually there is a way to win the race every time! Let's see that. Get access to the key using /opt/pctf/z1/exploitme. All scripts in cron.d will be executed, then deleted once a minute. A script's filename ends with `.sh`. So if we achieve to write a file.sh in this directory using setgid program privileges, we win! It first uses tempnam libc function to obtain a random file in /tmp. Note that the manual explicitely warns on race conditions using this function ;) Correct way of dealing with temporary file creation is to use mkstemp, which opens the file for you (race-free) and returns the file descriptor. Then it checks that this file does not exist using stat system call, and finally prints the temporary file on stderr (fd 2) before returning. Remember that unlink - by definition - does not follow symlinks. The enter profiling function prints on standard output (fd 1) that it is entering a function starting at address X. I do not show the exit profiling function because it does nothing at all. Hopefully, the program gives us (on stderr) the random filename it has computed. To win this race reliably, we would like to be able to stop program execution between these two moments. Some readers might remember my post about exec race condition exploitations. In this particular case, we are going to use technique #2 to make program block by connecting program's stdout or stderr to a filled blocking pipe. The principle is that, when the other end wants to write on it, its write system call will be blocking (and so program frozen) until there is room in the pipe (that is, until the other end reads from it). If we connect the filled blocking pipe to stderr, there's a problem: we also want to read the random filename from stderr. And as soon as we read the filename the program continues its execution. Solution: profiling functions! 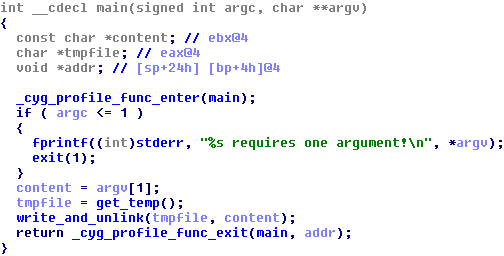 They write on stdout, so we can simply connect program's stdout to an almost-filled pipe that will get program to block at the right moment. Dividead's blog post Blocking between execution and main() includes a very good piece of code with blocking pipes that we can reuse for this exploit (and so I did). Thanks dividead! Update: very cool, @hellman translated it in Python! Haha very cool dude! I updated the post and mirrored your exploit.